I am often amazed by how dense with “story” a single song can be. Like a Russian Matryoshka doll, there’s the outer shell of the song itself, and then nested within that are layers after layer pertaining to the lyrics, the songwriter, how the song was recorded, where the song was recorded, why the song was recorded, and on and on. In 1966 Darrell Banks and Donnie Elbert wrote a song together that has often been regarded as “one of the finest non-Motown releases to emerge from Detroit.” The single, released on Revilot Records, made it to Number 2 on the Billboard R&B charts and 27 on the the Billboard pop charts; boasting a soulful vibe that probably made even Berry Gordy jealous. However when you start to delve into the rest of the song’s narrative, this sweet soul gem is a veritable symphony of story—not simply a two and a half minute pop song with a catchy refrain. According to various sources, Donnie Elbert originally wrote the song “Baby, Walk Right In.” Darrell Banks “completed the recording” and changed the title to “Open The Door to Your Heart” while his friend was away on tour. The label on the initial 45rpm pressing gives sole credit to Banks. When Elbert looked into the matter expecting to discover a clerical error, he was surprised to discover that Banks had submitted a song clearance form that listed him as the sole writer, and entitled him to 100% of the song’s “performance income.” Dismayed by Banks’ apparent misunderstanding of the term “collaboration” and definition of the word “partnership” (not to mention “friendship”), Elbert took legal action. As a result, subsequent releases of the song gave both men songwriting credits. However, Elbert remained bitter about the ruling. He claimed Banks had nothing to do with actually writing the song, and his claim to a 50% share of the credits was based solely on speeding up the original tempo and changing the song’s title. Darrell Banks released six more singles and two full length LP’s, but none of them enjoyed the success of the debut hit he never wrote himself. Four years after “Open The Door to Your Heart” shot to the top of the Billboard charts, the man considered by many to be “soul’s finest voice,” was shot dead in Detroit by an off duty cop when Banks pulled a gun on him for sneaking around with his girlfriend. Like Sam Cooke, Darrell Banks’ promising career was cut tragically short by the wrong end of a gun. One final chapter in this song’s multilayered story… “Open The Door to Your Heart” was scheduled to be released in the UK on the London label in August 1966. Decca—who owned London—competed with EMI for the rights to issue the hit from Banks’ US label, Revilot. Apparently Decca jumped the gun believing that they had won the deal, when in fact EMI had actually won the rights to issue Darrell’s US hit. Although promotional copies of the London single had been pressed, and a catalogue number had been assigned, all copies scheduled for public distribution had to be destroyed. London HL10070 was never officially released. Despite speculation about its existence, no one ever produced an official, non-demo copy of the London label disc until nearly fifty years later when a single stock copy that had been purchased from the estate of a deceased Decca pressing plant employee was put up for auction on John Manship’s RareSoulMan website in 2014. The “rarest British soul record of all time” eventually sold for £14,500. None of the subplots that lie beneath the vinyl grooves of this song reduce its allure as a jubilant R&B classic. 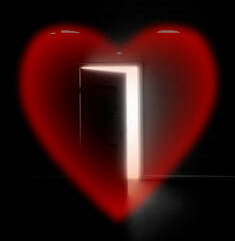 Music aficionado Cal Taylor calls “Open The Door to Your Heart” “a propulsive groover with a jumpy tempo, dynamite bass line, and incisive horn section.” I call it a perfect addition to the Happy Medium Song of the Day’s February list of heartfelt music.